I’m excited to be able to take part in a block challenge for our Santa Barbara Modern Quilt Guild!! Last month I confidently signed on to this challenge (I hesitate most times because often I am can’t attend the meetings), partly because I love these fabrics so much and partly because I need a fun and quick little project. It’ll likely be my last one in this sewing space. Our fearless leader Alissa, chose these great Denyse Schmidt fabrics. I added two of my favorite texty fabrics and I couldn’t resist a bit of Essex Linen (hope that’s okay Alissa)! She has asked us make the Japanese x and + block, by City Stitches. I look forward to practicing some new skills with this brand new to me block! Those are wonderful fabrics. 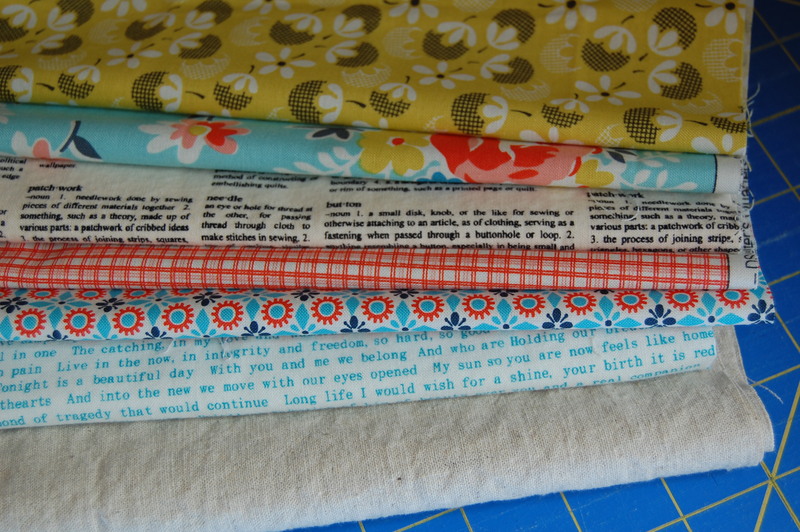 I particularly like the two fabrics with text and the springlike composition of the colours. I love piecing x and + blocks. Such a great use of fabrics : ) The finished quilts are always stunning! Love those blocks! Have fun! Lovely stack of fabrics, Karen! I’m sure you’ll make something lovely. Congrats on the upcoming move!